This is a very quick tip on how to change aperture on Nikon D40, Nikon D40x and D60 DSLR cameras. Make sure that your lens aperture can be changed through the camera. If you are using an older lens with an aperture ring, make sure to set the aperture on the lens to the largest number. There should be a lock on the lens to keep it at that number. If you are getting an error on the back LCD of the camera when you press the “Info” button, you should go back and make sure that the aperture ring is set correctly. This is not an issue on most new lenses and the latest generation of the Nikon lenses labeled with a “G” do not have this ring at all. For example, neither the Nikon 18-55mm f/3.5-5.6G VR nor the Nikon 35mm f/1.8G DX lens have the aperture ring. Changing lens aperture in Aperture Priority mode is very easy – just make sure that the dial on top of the camera is set to “A” position, then rotate the rear command dial to the left to decrease the aperture and to the right to increase it. In Aperture Priority mode, you set the lens aperture manually, while the camera picks the right Shutter Speed for you. Changing lens aperture in Manual mode is a little tricky. First, make sure that the dial on the top of the camera is set to “M” position. Next, press and hold the +/- button located right below the camera shutter, then rotate the rear command dial to change aperture. Rotating to the left will decrease the aperture, while rotating to the right will increase the aperture. 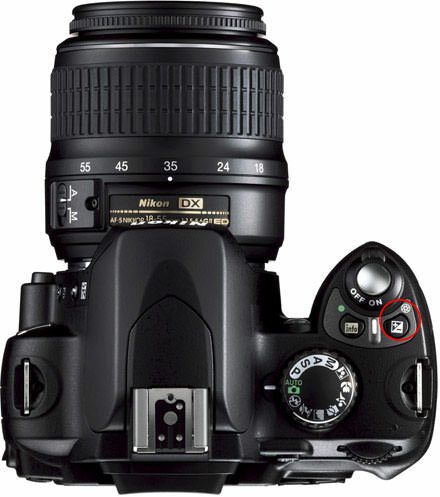 I am not able to change F value on Nikon d40 with AF Nikkor 70-300mm 1:4-5.6 G. Can any body help me out. No F value shown on camera display when i connect this lens with D40 camera on manual mode. Shafqat, is the lens properly attached? Do other lenses show the F value? Try setting the camera on aperture priority, then rotate the rear dial left and then right – see what happens. I’m playing with the aperature on my Nikon d40, and every picture I take has a blueish hue to it. I’m trying to come up with the nice, clean look of natural lighting pictures and not only is it blue it is aso coming up blurry 90% of the time. I went and reset all my settings and started from scratch, but still have the same problem. Any suggestions? Are you shooting indoors under artificial lighting ? You must then set the white balance , set to incandescent if shooting under filament bulb lights ( which give out yellowish light ), or set it to fluorescent if shooting under fluorescent lights like CFLs or tube lights. As for blurred images, you need more light to get faster shutter speeds. Since you want natural lighting ( I guess that means no flash) , you can only remedy this by fast lenses , like 35mm f/1.4G which do cost a packet. Otherwise you need to light up the subject with additional lighting such as those used in studios. Hi,I was just looking for the manual aperture modification you gave! you saved my life!!!! thank you! great article! I just wonder, where can I find my rear dial to change aperture speed for NikonD5100, please help! I am trying to take photos of flowers in sharp focus with the background blurred. I have a Nikon DX with the A setting to 5.6 (the lowest it will go) and the shutter speed at 1/125. The shots are all blurry and nothing is in focus. Ugh! Any help would be so appreciated!! how i can turn off the flash in Aperture mode on Nikon D40 ? very usefull indeed great job Sir! I am currently using my old D60 NIKON and learning with my tamron lense 70-300 and my nikon 35mm.